American expat, The Tom Cat, heads back to the States. Yes, my American amigo is going back to the land of the free and the home of the brave this coming October. Things won't be the same in Guimaras, his current stomping grounds, or in Iloilo, where my asawa and I presently reside. But Tom is going back to find employment. When he first arrived in the Philippines and worked as an oblate, or lay person, for the Trappist Monastery in a "jack-of-all trades" capacity for the monks of the Cistercian Order of the Strict Observance, he only planned to stay for a year. But Cupid's arrow struck his heart. He met the love of his life, the lovely LenLen, one of my wife's legions of relatives, so he extended his original stay. He might be gone for as long as two years, maybe longer. But like General MacArthur, he shall return to the Philippines. My friend is a true Renaissance Man. Engineering designer for NASA, the Tomahawk Cruise missile project, shrimp boat captain, furniture maker, website designer, master brewer. There isn't much he can't do. But a great dancer, he isn't. I first spied him attempting Michael Jackson-like moves in front of the stage at the Manggahan Festival in Guimaras a few years back. Tom was putting on quite a display, so much so, that I turned to my asawa and remarked: "I hope he's not an American. He's an embarrasment!" I'm sure others have thought the same of me especially if they witnessed my antics with "Fearless Frank from Florida" during the 2012 mango festival. But Brother Tom, as he was known as that time, and I crossed paths a few days later and became good friends. Tom is friends with everyone. Tom is actively seeking employment in the United States and is pursuing various opportunities. If you know of anyone that could use a multi-talented graphic designer, who has completely redone the product line of the Trappist Monastery among other projects, leave a comment on this post, and I'll forward your interest or lead to Tom. I want to help him as much as possible. 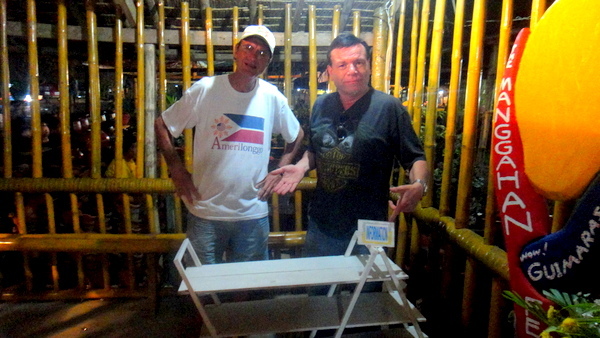 My expat friend will be building a new home in Guimaras upon his return and word is that he will be coming back with "Fearless Frank from Florida" to help with the construction. Frank is a master builder who specializes in plumbing renovations. Len2 will be working and living in Jaro, Iloilo, with her sister while her man is away. She'll tough it out during Tom's absence but they will remain in touch. My amigo, at age 54, is too young to collect Social Security and doesn't have a pension plan from a company to fall back on as I was fortunate to acquire with almost 30 years of employment with AT&T, the telecommunications giant. But as I remarked earlier, Tom's original plan was to only stay in the Philippines for a year. However, he's very adaptable and self-sufficient and disciplined himself to live on a lower budget than we have access to. He'll do great upon his return to America, but I'll really miss the guy. He's an original. A good guy. True friend. And one extremely talented man. Durned money…. I know it’s necessary, but “H”, “E”, double toothpicks! Tom Cat, you’ll be missed! That he will be, Rease. As you know, The Tom Cat is an original. Say it ain’t so! I will miss Tom Cat stories. He needs to blog. So many unanswered questions…How did he end up with the Trappists in the Philippines? Who taught him those terrible Michael Jackson movies? Good luck Tom Cat. Stay thirsty my friend. Tom Cat blog? Hmmmm, now there’s a suggestion I can run by him, Steve. Good idea. How did he end up at the Trappists? Tom needed a sabbatical (for personal reasons) and wrote/emailed the monastery offering his services, though Tom is of the Benedictine order, although not a full-fledged monk or brother. Being a man with so many talents no doubt he’ll find something here in the states. On the dance moves,I’m guessing he’s a deadhead. When they play a song he hears Casey Jones and does the kind of moves we would see during Woodstock. Good Luck Tom. Tom will be missed. He’s a very intelligent funny guy. We really appreciate LenLen and him allowing us to stay in his farm. Hopefully he will get employment fast and be back within 2 years time. With the implementation of Guv’ment-run health care, we are quickly becoming a nation of part-timers. Even though B.O. delayed (unconstitutionally) the employer mandate by a year, the “full-time job with benefits” is becoming history. And that’s beside the overall weak job market. My best wishes for Tom, but, really, not a good time to be coming home to look for a job. Nope, Len2 is definitely not back on the market, Ice Man. She’s dedicated to Tom and is going to wait for him. The Design Farm, a different creature from the actual farm that Tom lives on, will remain active. Tom has only started that website, The Design Farm, fairly recently, and will keep that in operation. There are other plans afoot for the actual farm property, run by the Trappist Monastery and a group of Sisters. Yep, doesn’t seem to be the best of times to seek employment in the States but Tom’s skill set, along with his dogged determination and absolutely positive attitude, might help. I’m hoping and praying the best for him. He deserves it. He already has several interviews in the pipeline. I’m sure he’ll keep me posted and I’ll pass on any news once I hear it. A deadhead is what they call fans of the Greatful Dead. Thanks, Art. Gary, in the last photo Tom is wearing a Grateful Dead cap. I had co-workers that would spend hundreds of dollars just to see a Dead concert. Me, I was more into heavy metal and followed Beavis and Butthead’s favorite group, Metallica. Went to dead concerts one at the capital center outside DC and the other in Eugene, Oregon. The one I went to in Eugene was still going strong at 3 am. but I was using my parents car and had to leave at that time. Free tickets for the one in DC and someone opened the door at MacCourt in Eugene and said Come on in man and enjoy the show. how do I order Mango Bars they sure look good in the picture. I buy a lot of mangos at Costco and also dried mango from Cebu but none of the bars. Don, I’ve found Trappist Monastery products at our nearby SM Supermarkets. The mango bars are delicious. Let me email The Tom Cat and find out where the products are distributed. The Mango bars and all of the other products are EXCELLENT ! Yes, they are Fearless Frank. Looks like your old school chum his heading back to the States. Maybe he’ll bring some of those mango bars with him. You’ll be missed, Tom Cat. You have made so many good friends here. You’re truly an original. By the way, Mr. Don, see remarks below, is wondering how he can order those delicious mango bars from the Monastery. 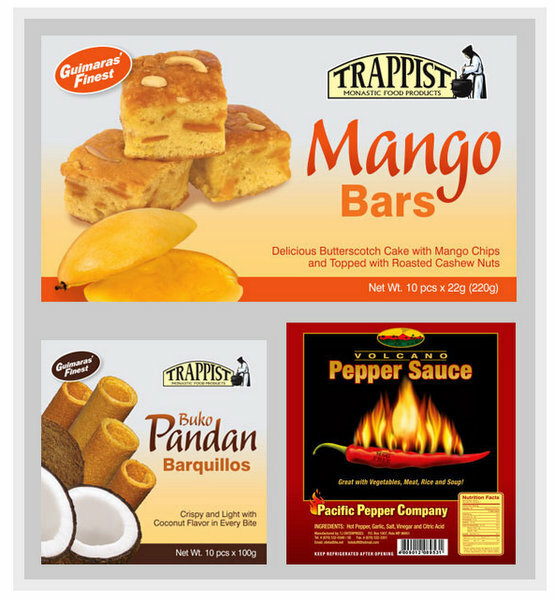 I know the Trappist products are sold in Iloilo but are they available in any venues outside of Guimaras or Iloilo? Thanks for everything, Tom. Do you know of any decent, reasonably priced rentals on Guimaras? I am thinking of coming there probably around next April for an extended stay. Hi Craig. Have you been to Guimaras before? Not many rentals available aside from pension houses. San Miguel, in Jordan municipality, is where my wife built a home. We plan to move back to Guimaras this coming October. Nearby Iloilo, where we presently reside, and only a 15 minute pump boat ride from Jordan Wharf, has many more rental options. You could rent a house in a nice subdivision from 5-6 thousand pesos, 112-135 US Dollars. With the peso to USD exchange at a three-year high for us Americanos, at 1 USD = 44.5499 PHP, it’s a great time to come on over. The Tom Cat will return, roxasron. But in the meantime, the San Migs won’t taste quite the same without my good friend around. I just found this page while checking out inflation and projected exchange rates (U.S. dollar to Phillipine Peso). What a relief when I saw the upward trend for the dollar! As I write this the rate is 44.57. Not bad. I also noticed inflation has come down to about 2.5%. All that good economic news in the Land of Smiles means I’ll be heading back to be with my asawa by December from where I am now in sunny Jacksonville, Florida! I wanted to chime in on the “finding work” issue here in the states. 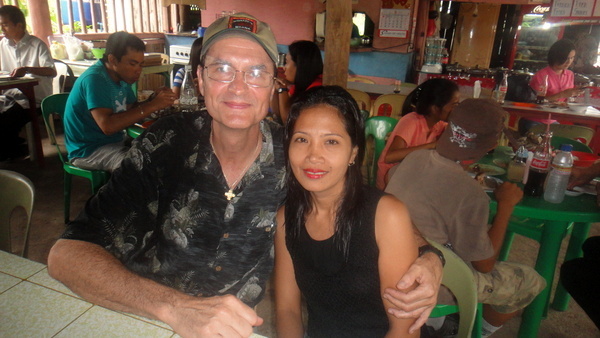 I reluctantly left my wife in the Philippines to return to my former home to find a part-time job in America so I could qualify to sponsor her visa; my Soc Sec. Disability income falls just a tad short. It was really tough to leave after being there with her for the better part of the past 5 years. I left in April and still no luck finding work. Then again I don’t have all the skills Tom has. In addition I had to be very selective due to my disability – nerve damage in both legs prohibits me from standing and/or walking much at all. My wife wants me to come back and just live out our days in the Philippines. That’s fine with me! I’m just happy to have enough coming in from SSDI to enable me to return. I feel sad for Tom because he has no choice! But he’ll come through this just fine. That said, there IS work for a healthy and personable man with skills. Tom will find something but he may have to settle for less than he’d like. The salaries in America these days aren’t keeping up with inflation. When I return I plan to apply for a 13A and Work Permit and then attend a tech school to learn web page design. Once I know how to build and monetize a site properly I’ll be blogging my little heart out; lol. At least I can do that from home while waiting for my wife to get home from her job with the DepEd office. Thanks for this awesome web site and to Tom…Good luck and best wishes. You’ll find what you need. I’m sure of that. Glad you discovered my site, RufJag. I’m extremely sorry to hear that you had to leave your asawa in the PH for a time in order to pursue a job in the States. 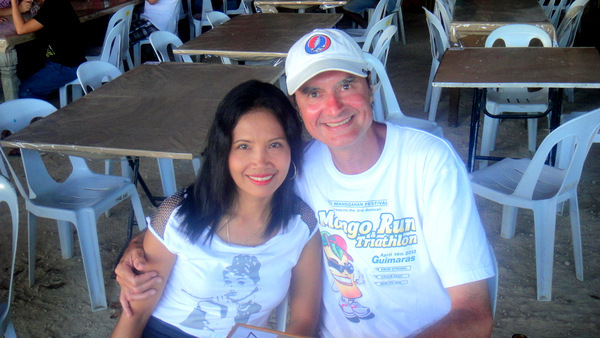 It took nine months for my wife to join me in the States after we got married in the Philippines. Those were some tough times waiting for her arrive in America. But you’ll be returning in December and that’s great. I’m sure Tom is under no illusions that finding a job in the States will be easy. I’m hopeful he’ll find one soon. I don’t know web page design (though I did create the new lizard logo.) Sounds like your class you plan to attend will give you a level of skills I don’t have. My Webmaster Supreme is based in Houston. Almost 7,000 miles away and he can help me in the Philippines (for example, the great new theme he installed for me.) Takes a lot of work and dedication to get a website up and running and monetized. I had zero knowledge in that field four years ago when I started my first blog. But it CAN be done. Good luck to you and yours and thanks for the insight.